Heat Shimmer rips through their debut with glistening intensity. From Bikini Kill to Beat Happening to The Microphones, Olympia, Washington has been an epicenter of iconic bands ranging from the punk to the experimental since the nineties. At the end of 2016, Olympia bred yet another band that has the strong potential to make waves: Heat Shimmer. 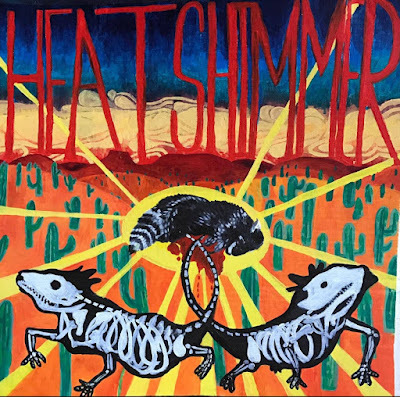 Although their roots are tied to different cities across the country, Heat Shimmer’s self-titled album is inherently reminiscent of those staple Pacific Northwest bands. With the intoxicating shreds of Amber and Madi on the bass and guitar alongside Johnny on the drums, the new trio rips through their debut album with glistening intensity. "Soft Serve" fades in with the bass as the other instruments greet each other before Amber enters with soft vocals. Almost immediately, Heat Shimmer has all of the right ingredients to be the latest invigorating lo-fi band that you play on repeat over and over again throughout the day. The lyrics “best to get high and forget about it” are constantly repeated within the song, a cheeky homage to the angsty garage bands that have come before them. The song ends with almost a minute of jamming accompanied by Amber’s piercing vocals, carrying that power straight into follow up "Boys on the Run,” a seamless end and beginning melded into one. Once again, the listener is led by the hand into the song, as the tempo picks up almost a minute into the song only to hastily return to elongated phrases and mid beat drum tempos. “Dead Sam” takes more of a sunny surf pop approach, serving as a lighthearted hiatus from the harsh punk overtones of the rest of the album. Immediately following comes “Earth Angel,” which speaks to the age old history of reminiscing on past relationships. It's hopelessly romantic like its namesake, yet remains a pure rock song as the instruments blare above Amber’s lyrics, synthesizing the two into an infatuated punch of punk glory. Filled with indistinct chatter and a strong fusing of reverb-y guitar and bells, single “Blood on Your Hands” follows the unconventional love song. The track remains upbeat until the last few beats as the vocals fade out with titillated cymbals, providing an entryway for the noisy introduction of “Travis the Chimp.” “Skinned” provides an airy lightness to the album rarely found on Heat Shimmer with angelic vocals floating about. The album closes with “No Tornado,” a shredded ribbon of punk to tie the whole album together. Heat Shimmer ditches the momentary chillness at the door for a fiery final song to leave a lasting impression. Heat Shimmer’s self-titled album is a perfect combination of the genres that have defined Olympia for the last two decade while serving something that's entirely their own. Listen to Heat Shimmer on bandcamp.